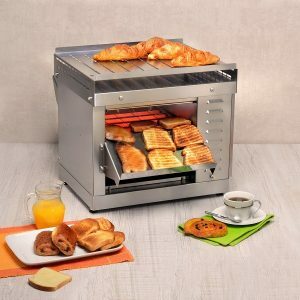 Ideal for breakfast buffet this heavy duty versatile conveyor toaster toasts everything waffles bagels to muffins and even from bread to buns with an optimal output of 300 – 540 pieces per hour according to the thickness of bread with no pre-heating. Both sets of 4 infrared quartz elements are individually controlled as well as the speed of the conveyor belt to give the desired result every time. 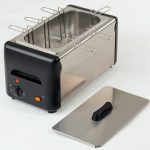 The back can be removed for front or pass through operation: Front operation to toast bread brioche bagels etc. Pass through operation to toast baguettes garlic bread small pizzas etc. 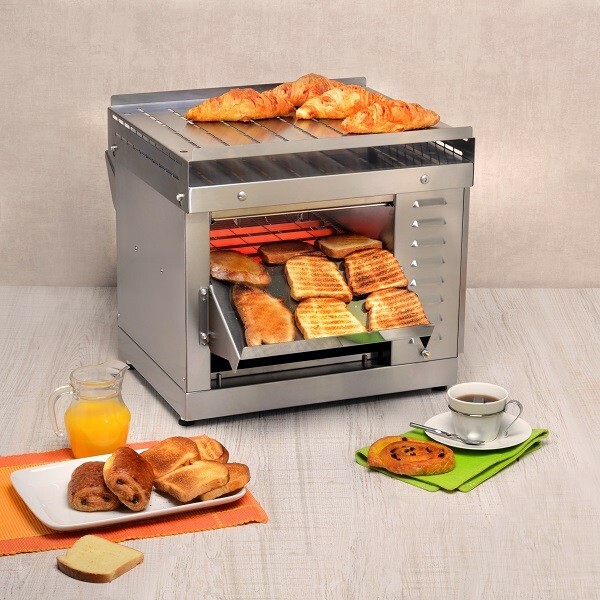 Features: Independent control of top and bottom elements; belt speed adjustment; pass through option, removable heat guard/warming tray. Accessories: control panel blanking cover.